Presentation will be key for the dog ... It will also be served with fries. When you order one of the monstrosities at the Captain Morgan sports bar, it will be brought out on a two-foot long cutting board. The Rangers are somewhat renowned for oversized foodstuffs; last year, they started selling a three-pound pretzel. But this just seems kinda gross. 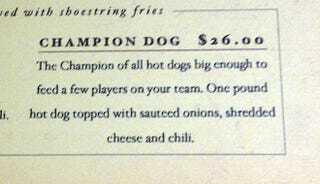 The Champion Dog is supposed to feed four people, though that might be a misguided hope. I mean, have you seen the size of some of the people who live in Texas?